I am trying real hard to finish sharing some of my recipes from this year so I can get to sharing some holiday treats with you! I have been baking up a storm and I feel guilty that so many of these great recipes get put on the shelf because a seasonal recipe takes precedence. So I get it. Lemon isn’t the “seasonal” flavor right now. But here’s the thing. In my book, if I don’t make something with chocolate, it’s because I have a taste for lemon. I love all things lemon, any time of year. So I am hoping there are more people like me out there! People who eat lemon cupcakes while putting out Christmas decorations with Thanksgiving centerpieces on the table. If you’re NOT that person, then save this recipe for a more fitting time in your life. That’s cool with me. Just be sure to make this, it’s amazing. HONEST. Love this Lemon Cupcake Recipe? You may also enjoy these recipes…. For the frosting, beat butter for 3-5 minutes until pale in color. Add powdered sugar, lemon zest and lemon juice (about 2 Tbsp from fresh lemon) and cream. Beat for 3-5 minutes until fluffy. Frost cupcakes by filling a pastry bag with tip and pipe on the frosting. ENJOY. *if you prefer a yellow cupcake, add 1-2 drops of yellow gel food coloring to give it a bright color! These are stunning! I love lemon desserts. And I’d probably eat this buttercream with a spoon! You make the prettiest desserts, Aimee! They are just stunning – you’re the cupcake-decorating queen. Love these! I love using buttermilk and I always have leftover egg whites and I love lemon. These look scrummy! 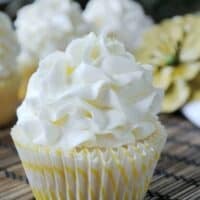 I love lemon cupcakes, Will have to try them once my lemon tree ripens up! A lemon tree? Are you kidding me? So jealous…. Yep, I’m definitely with ya! Lemon is actually my favorite kind of cake. I LOVE it! So refreshing and moist and delicious any time of year. I actually super love it at Christmastime, too! Helps break up all the chocolate and eggnog and peppermint, ya know? These look so luscious, Aimee! Aimee that cupcake is soooo pretty!!! I want to swim in that frosting. I made these yesterday for a holiday party. Everyone loved them. I also used a 2D tip for the icing, but my lemon zest clogged it up. As a result, the icing wasn’t as pretty, but with some gold sprinkles on too, no one knew the difference. These are beautiful! I bet they taste pretty darn good, too! oh dear lord, seasonal or not lemon desserts will ALWAYS hold a place in my heart. I honestly LOVE lemon cake, but I top mine with cream cheese icing – now LEMON buttercream? I can totally get on board with! Take me back to the summer with these babies, I must make them!! Can’t wait to see your Christmas lemon idea!!! That looks so yummy. Great pictures! Come and visit us. We are having a great giveaway this week from Pick Your Plum – $75 swank bag. I am soooo excited about this. My daughter and husband adore lemon. So I guess I know what I am making for her next birthday. Even though she request lemon cake with raspberry buttercream in the middle every year. I might just have to change it up. Thanks!! OH these look so delicious! I can just eat the frosting, add some more, eat it again, then eat the cupcake. YUM! These cupcakes look so pretty!!!! I absolutely LOVE anything lemon any time of year! These cupcakes look amazing! Serioulsy the best thing I’ve seen all day! ohh, I love a great Lemon cupcake!! And the icing is so fluffy!! love love love love looooove!! YUM! My mom used to make the BEST lemon bars. I’ll miss not having them this year, but maybe I’ll try these cupcakes instead. I’m with you- love lemon all year round! These are beautiful! I can eat lemon desserts anytime! These are simply breathtaking, Aimee! Soooo beautiful! I’m with you … I can eat lemon any time of year. Lemon is a nice break from all of the rich and heavy holiday treats. These look Amazing, pinning! Thank you Rachel, they are a popular flavor request here at Shugary Sweets!!! wow, they look delicious. And those cupcake liners are perfect! I would be honored if you shared this at my Ginger Jamboree Link Party! 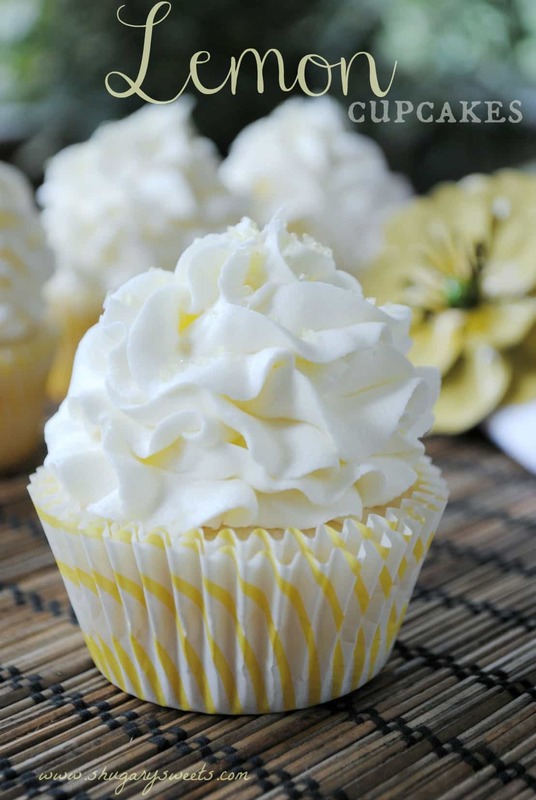 Lemon cupcakes with lemon buttercream must be amazing! I’ve featured this recipes on my blog! I hope you don’t mind! If you don’t agree with that please contact me and I will remove it. All the best. I made these last night for a party that my friend is having. I doubled the recipe because there are going to be so many guests (note to self/others: do two separate batches next time because my Kitchen-Aid mixer could hardly handle it!) They are AMAZING. The flavor and texture is perfect. Light and fluffy with just the right amount of lemon. I left them in about 30-60 seconds longer because some of them were a little underdone at 15 minutes and as a result, they collapsed a little. I haven’t frosted them yet, but if the frosting is like the cake, I know it’ll be perfect. Thanks for sharing! Hi Katie, I’m so happy you enjoyed these cupcakes! So delicious!! I made these tonight because I had a craving to bake. My boyfriend picked them out on Pinterest. They were absolutely divine. 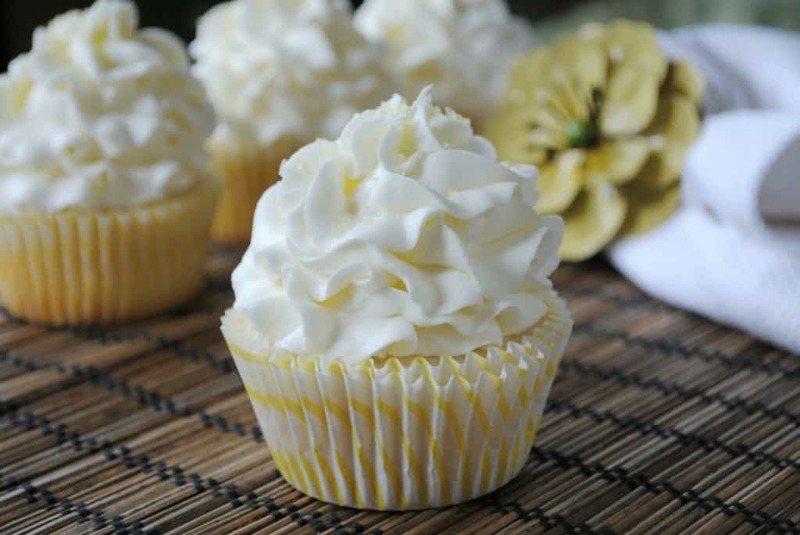 I have bookmarked the recipe in case I ever want to make lemon cupcakes again – and also to use it for that incredible buttercream frosting recipe. It’s perfection! Thank you! I love lemon, but my son does not. I am looking for a white cake recipe. Can this recipe be used minus the lemon? Absolutely!!! It’s my basic white cake recipe with lemon added. ENJOY! I’m just wondering what tip you used to decorate the cupcakes with and also how you did it? hello! I’ve just done making the frosting but it was not a success :(( can you tell me where i’ve gone wrong? I thought maybe i overbeat the butter so it was already runny before i added the rest? or could it be that i divided the recipe ingredients by 4? Without being there I wish I could tell you! By beating the butter it definitely should NOT have turned runny. I would say maybe the butter wasn’t right? Was it unsalted butter (NOT margarine?). Dividing the batch shouldn’t matter, as long as all the proportions were right. Sorry I’m no help! could it be that i use a substitute heavy cream? still so confused, I did use unsalted butter but it did not turn pale an definitely not white like in the pictures. Sigh. Hmmm, I think it must be something with the butter you used, because once you beat it, it should be very pale yellow (and NOT runny). Maybe switch brands? May I ask what frosting tip you used? Love the look of these. Hi Wendy, I used a large 2D tip! ENJOY! These cupcakes are beautiful. Do you whip the egg whites separately or just mix the egg whites, buttermilk and lemon zest? Hello! Love the looks of this recipe. QUESTION…..can this bater be made WITHOUT the lemon? Used as a white cake? Maybe just adding a little vanilla? Looking for a great white cake recipe! I make Hershey’s Perfectly Chocolate Chocolate cake and I LOVE the batter, but wish sometimes that I could make it without the cocoa. Not sure if it would turn out right. Thanks. Can’t wait to hear from you. Lisa, YES. This lemon version is based off my white cake recipe. Just omit the lemon and you will LOVE it!!! Let me know what you think. You’re welcome! Enjoy the cupcakes! Hello! I have one quick question-it appears that the lemons for the cupcakes themselves are zested only-the juice isn’t used-am I right? The only actual lemon juice you use is for the frosting-right? Correct. You will have some naked zested lemons from the cake portion. I usually slice them up and put them in a big pitcher of water. But, you are correct. The only juice is in the frosting. Very good recipe. The cake was a little spongy and sweet. The buttercream frosting was amazing with the hint of lemon. Thanks! 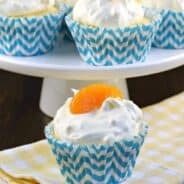 I just came across your blog — I L-O-V-E all kinds of citrus, and these lemon cupcakes look delish!! I can’t wait to try them out. Thanks for sharing! What did you sprinkle on top? Just some sparkling sanding sugar sprinkles! I made these last night and they are so yummy! I, also, had some lemon flavored sugar that I just sprinkled on top after they were frosted. Thank you for sharing your recipes. I just made these beauties. I find I don’t really like buttercream frosting. My parent loved the frosting. My mom ate out of the bowl. And my dad had 3 already. For me all I could taste was butter. The cake was AMAZING. Definitely spongy. Loved the cake. Clelia, Cake flour is lighter than AP (all purpose) flour….if you have access to corn starch you can use the following substitution: 1 cup cake flour = 3/4 cup (12 tbsp) AP flour + 2 tbsp cornstarch, sifted together. However if you don’t have access to cornstarch, many baking tips online even suggest substituting 1 cup – 2 tbsp AP flour & sifting it 2-3 times to lighten the texture. Hope this helps! I made these cupcakes for my grandmother’s 89th birthday!! She and I both have an affinity for lemon sweets, and these were perfect! I made regular sized cupcakes and mini cupcakes. The mini cupcakes I cooked for 11 minutes. I topped all with the fantastic lemon buttercream frosting and either a blackberry or raspberry, then served with a choice of red raspberry or blackberry ice cream. The family LOVED them!! I will definitely be making these again soon!! What size tip did you use to make this gorgeous top? So beautiful. Sorry for previous question….I now see you answered above. Hi Aimee! Do you have any tips for the piping? I made these just now. The cake is VERY dry. I had to bake for 18 min because the centers were still raw dough at 15 min. I’m sure my husband will eat these but i need a giant glass of milk just to get the dryness out of my mouth. I would double check your measurements. This definitely is not a dry cake recipe. What tip did you use for piping the frosting? It looks great! I love lemon too! Just finished making these and enjoying one with a cup of tea. This is a really good recipe. I did substitute all purpose flour (forgot to buy the cake flour today)and they still are delicious. Love the frosting and enough to frost all the cupcakes . I don’ always find that to be the case with other recipes. Going to make these again with the cake flour, but can’t wait to share these with my family! I know they will love them too! Lovely, thank you! Do you know if these freeze well? I’d like to make them for my sister’s wedding… but not the day before! Lemon in always in season in my book! These look incredible. Beautiful photos! Pinned and definitely going to try these! Should I make any changes if I change lemon to orange? Can’t wait…I already have a lemon flavor for the dessert table so would like to try this as an orange flavor. Thanks. Your frosting piping is excellent. No changes needed, I’ve made them orange too. And lime!! Love at 1st taste – these are awesome! I added more lemon juice too. I could eat a bowl of the icing alone and I never eat the icing!!! Thank you! My new fave site! So glad you loved them Hillary!!!! And I’m thrilled you found me! Happy baking! How did you guys store these? Airtight on counter or in frig? 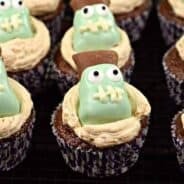 I store on counter in a cake/cupcake server. Yumm!!! 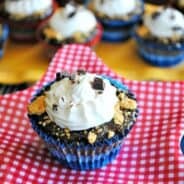 I just made these and they are delicious!! Rich and lemony! The texture is great, super moist and the tops got a little crunchy. The icing is perfect. I will definitely be making these again! Love! So glad you loved them. They are definitely a favorite around here!! Add some lemon curd to the centers after baking them next time, YUM. Just made these, they are perfectly delicious! I did not get anywhere close to 30 though, did you use mini-muffins tins? Also for people not used to making their own buttercream, I had to add more powdered sugar, apparently I grabbed a very juicy lemon! Anyway, wonderfully moist cake with just the right amount of lemon topped with a great icing! These cupcakes look heavenly! I love lemon cake! Made these for my Grandma’s 90th birthday party yesterday (filled with lemon curd). They were so delicious, light and fluffy! Thanks so much for the recipe…. Can’t wait to make them again and also try the white cake version! Thanks so much for commenting! I’m so glad you loved the cupcakes, and thank you for pinning 🙂 Happy birthday to your son! These are delicious!!!!!! So light and fluffy!!!! They look wonderful! My husband is turning 50 and he loves lemon, I thought about making these can I freeze them once I have put the icing on? I have never tried freezing them! This recipe is unbelievably tasty. I give it 5 stars!! These lemon cupcakes look charming. Taste balance seems in harmony. Thanks. Is this recipe adjusted for high altitude (7500)? Unfortunately it is not, I’m not sure what adjustments need to be made in high altitude. I don’t refrigerate them. But they can be if you prefer. I made two kinds of cupcakes for my husband’s birthday and this was one of them. They had an angel food type texture and you could see the lemon zest, so pretty. I baked them for 18 minutes but I may have over filled a little, didn’t realize how much they would rise with 1 Tbs of baking powder. The flavor was amazing. Next time, I would add the egg white/buttermilk mixture to the butter and sugar followed by the dry and then the remaining buttermilk. I don’t care for traditional buttercream but everyone loved it! The other frosting I made was cream cheese, white sugar, lemon curd, and whipping cream. That would be good on these too. I would definitely make these again, thanks for sharing your recipe! What size/kind of tip did you use? Aimee, I want to use this recipe for some cupcakes that will be decorated with drop flowers. Will the frosting be white or a pale yellow? Looks white in the picture, which is what I need. Thanks! It’s a VERY pale yellow. Have you tried this in round cake pans? Could you use regular flour instead of cake flour? And the cupcakes also look gorgeous ??? ?